Tea comes fromCamellia sinensis, an evergreen shrub native to East and South Asia. (“Herbal teas” are made from other plants and are not true tea.) Tea has been consumed for thousands of years in Asia, where it is an important part of many cultures and has long been associated with health benefits. In China and Japan, in particular, its preparation and presentation have been taken to the level of an art form. Green tea, popular in Asia, is minimally processed—the leaves are steamed, rolled and dried. Black tea is withered, rolled or crushed, and then “fermented” (in this case meaning oxidized, or exposed to oxygen) before being dried, which makes it black and stronger in taste. Oolong tea is partly fermented. White tea is harvested in early spring; the young leaves and silvery white buds are just steamed and dried. Like coffee, cocoa and many plant foods, tea contains hundreds of biologically active chemicals, notably a wide range of flavonoids and other polyphenols, which can be absorbed and used by the body to varying degrees. The chemical composition of tea depends on the specific botanical variety, how and where it is grown, and how it is processed. Green tea, for example, is rich in catechins, including the potent antioxidant EGCG. In black tea, the catechins convert into other compounds during fermentation. Oolong tea falls between black and green teas in composition. Various polyphenols have different effects in the body. Other factors affecting tea’s chemistry include its age and how it’s stored, brewed and served. Longer steeping time results in more polyphenols being released, though steeping for more than three minutes or so usually doesn’t increase these compounds significantly. Decaffeinating tea reduces its catechins. Instant and bottled teas generally have lower levels of polyphenols. Some research suggests that adding milk to tea binds catechins and reduces their effects somewhat. Lemon, in contrast, may enhance the body’s absorption of catechins. Following new scientific developments, research into the health effects of green tea has advanced significantly. 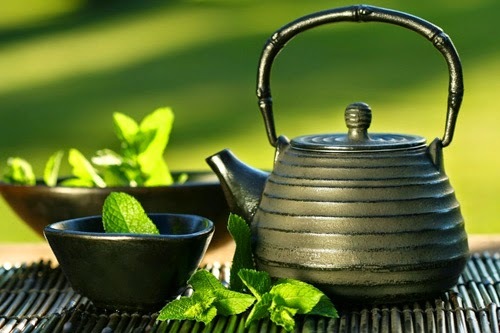 Studies have shown that green tea is made of several main components that contribute to its character: catechins (texture), caffeine (bitterness), and theanine (flavor), as well as various vitamins and minerals. Present in large quantities of green tea, catechins (including EGCG) are a type of polyphenol that is also a component of red wine. Catechins also give green tea its signature texture, and as a potent antioxidant, hinders dangerous free radicals in the body. Caffeine gives green tea its bitter taste, while increasing alertness, and relieving fatigue. Theanine, an amino acid, gives green tea its taste and acts as a mild relaxant. Theanine helps to relieve the jittery effect that caffeine can sometimes produce in sensitive individuals. This makes it a great alternative to coffee which not only has higher levels of caffeine, but does not contain theanine to regulate the unpleasant physical side effects. These are the main research properties included in green tea. Green tea contains a well-balanced mix of these ingredients. White Tea is the least oxidized of all types of tea. Because of this and the higher proportion of young bud leaves, white tea is usually very low in caffeine, which makes it a good choice for people who are watching their caffeine intake. Many people believe white tea to be even better for you than green tea because it has been processed less. Research has shown that white tea contains the same free radical fighting catechins as green tea. White teamay help to prevent heart disease, cancers and stroke, as well as helping to treat diabetes. High levels of calcium and fluoride may help maintain healthy teeth, gums and bones. White tea is an excellent addition to your daily routine. Oolong Teas are unique because they span an oxidation range of 20-80%, where some are closer to green teas, and others are more similar to black teas. Caffeine levels vary accordingly, where greener oolongs will have less caffeine content and darker oolongs will have higher caffeine content. Oolong teas, because they have higher oxidation levels than green tea, will also have lower catechin levels, although catechins are still present. However, although catechins decrease with oxidation, theaflavin and thearubigin levels increase. These polyphenols may help in defending the body against stroke, dementia, heart disease and cancer. In addition to this, oolong teas have long been believed to aid in digestion, so have a cup with or after your next meal. Black teas contain the highest levels of caffeine among all types of tea. For someone who is looking for an efficient energy boost, this would be a great choice. However, for caffeine sensitive individuals, consumption of black tea should be moderate. Black tea does contain low levels of catechins, but is noted for having the highest levels of theaflavins and thearubinins. As more research is showing, these compounds may be just as effective as the catechins in green tea in preventing heart disease, stroke and cancer, and lowering cholesterol. So don’t think that that your morning black tea isn’t as healthy as your cup of green tea in the afternoon. You are just consuming a different variety of healthy compounds. Our common Lipton tea falls under this caategory. The unique processing of Pu-erh teas, where the leaves are literally fermented and aged, chemically changes the makeup of the tea. Pu-erh tea has varying, but generally low levels of caffeine. It also contains very high amounts of flavonoids, which are aggressive in lowering LDL cholesterol and lowering blood pressure. Studies have shown that pu-erh has the ability to break up fats, which makes this tea especially effective at aiding digestion after particularly heavy or greasy meals. Traditionally, this type of tea was also believed to aid in weight loss, and is now included in many “slimming” tea formulas. Recent studies have shownthat this type of tea maydecrease body mass and increase metabolism. While it may or may not aid in maintaining a healthy weight, the other benefits to the heart and body are important enough to consider trying this unique tea. Herbal “teas” or tisanes are not true teas, because they do not derive from the Camellia sinensis plant, however these tisanes have some virtues of their own. Most notably, these infusions do not contain caffeine, which makes them acceptable for young children, the elderly or for evening tea drinking. A specific example, rooibos, a red bush from South Africa, has high levels of antioxidants and vitamin C, as well as being caffeine free. Lavender has been used for generations to promote relaxation and to calm the mind and body. Chamomile, while also having strong calming powers, has been used as a natural pain reliever when prepared in strong infusions. Peppermint is used by many traditions, especially in Moroccan culture, as a tea to help aid in digestion and to clear the sinuses. These herbs, while not having the super powers of the Camellia sinensis plant should not be overlooked, as they do have their own more subtle benefits and can be enjoyed by anyone at any time of the day. *Tea drinking appears to lower the risk for heart disease and stroke. *Natural compounds called polyphenols in green tea might protect against several cancers, including those of the prostate, GI tract, lungs, breast, and skin. *Caffeine and antioxidants called catechins found in green, oolong, and white teas may increase metabolism and promote weight loss. *Tea polyphenols are thought to strengthen bones and protect against fractures. *People who drink tea could see improvements in mood, concentration, and performance. Unless it has been decaffeinated, tea averages about 40 milligrams of caffeine per six-ounce cup (versus 100 milligrams in coffee, on average), depending on the type, brewing time, and other factors. Black tea tends to have more caffeine than green. There doesn’t seem to be a downside to tea,” says American Dietetic Association spokeswoman Katherine Tallmadge, MA, RD, LD. “I think it’s a great alternative to coffee drinking. First, tea has less caffeine. It’s pretty well established that the compounds in tea – their flavonoids – are good for the heart and may reduce cancer. Tags : Health Benefits of Drinking Herbal Teas. Soybean: A Review on the Health Effect of Soybean Consumption. Adverse Health Effects of Flouride Use.